Here is an excellent plug-in for WordPress galleries that that enables developers to easily align thumbnail images into a conveniently justified grid. This process is made available through jQuery. Justified Image Grid offers over 50 settings and up to 10 presets, Lightboxes, prettyPhoto, multiple image sources, contextual help, mouse over animation, shortcode editor, as well as a host of other important features. 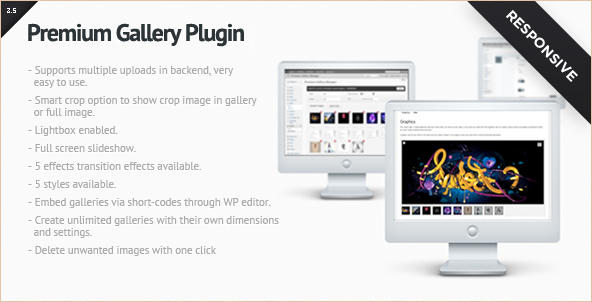 The plug-in is fully capable of replacing a standard WordPress gallery, thus enabling a variety of new features and options. This handy plug-in also allows users to load images quickly and conveniently from sources such as Facebook and Flickr. In addition, Justified Image Grid includes full and comprehensive support along with quick and accurate replies, and is fully responsive across a wide range of platforms including mobile devices. Designers and developers should try this unique and useful WordPress gallery plugin today and experience the power of Justified Image Grid. Wall/Grid Gallery is a fully responsive and highly capable plug-in for WordPress galleries that features a number of useful functions. For example, this plug-in includes a fully responsive layout, over 60 customization options, the ability to easily integrate YouTube and other video sources, simple and intuitive touchscreen navigation, the ability to quickly add labels and tooltips to a variety of thumbnails, social sharing functions, fully functional shortcode generator, as well as AJAX administration functions. This highly useful plug-in will assist designers and developers in easily adding a wide array of grid type galleries to any WordPress website or WordPress blog. Because this gallery features the ability to be highly customizable and resizable it is extremely useful for visually intensive type websites. The plug-in is fully compatible across a wide range of browsers and device platforms. It also makes integration with pages and posts intuitive and easy as well as highly effective thanks to shortcodes. Designers and developers should experience this clever plug-in and watch their galleries blossom with creativity. Wall/Grid Gallery will add the element of grids to your site in a unique and inspiring way. This useful and fully functional WordPress plug-in for galleries enables users to create galleries with an unlimited number of albums. It is user-friendly with convenient AJAX admin, HTML generator for external use, as well as a number of highly customizable features such as hover effects that include grayscale and other similar type filters. It offers fully editable album titles, language translation, the ability to display one album from a gallery, as well as features such as Fancybox and Lightbox. This ingenious and cleverly designed WordPress plug-in allows developers to create a virtually unlimited number of galleries that are able to contain an equally unlimited number of albums. The plug-in is simple to use and offers a number of copy and paste features. In addition, it offers a variety of demonstration videos making the use of this plug-in simple, easy and convenient. This robust plug-in is highly responsive and features excellent customer service. Designers and developers in search of a great plug-in for galleries will truly enjoy this great product. Try Fancy Gallery for creating an unlimited number of galleries. 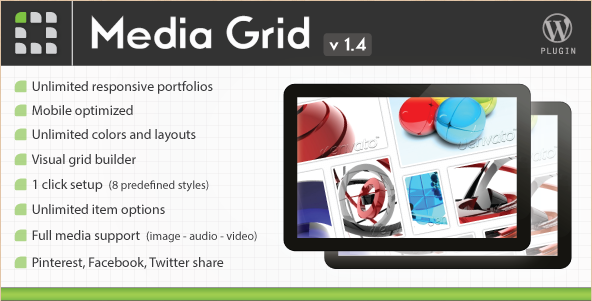 Media Grid is an excellent WordPress gallery plugin that features unlimited responsive portfolios, mobile optimized features, virtually unlimited colors and layouts, fully visual grid builder, simple one click set up, unlimited item options, full media support including video, audio and image, as well as full functionality with social media. This plug-in enables users to easily and quickly create responsive and fully filterable portfolios for websites and blogs. Media grid features a scenario layout that will quickly adapt to a number of scenarios and is fully mobile optimized. The plug-in also features full AJAX support as well as slider captions and improved media selector. Other features include spacer item functionality, custom content by item type, as well as full-size image and max height control functionality. Video Gallery is a unique and fully functional plug-in that features up to three skins, full iPhone and iPad compatibility, highly functional and extensive admin panel features, a wide range of simple shortcodes, as well as being fully responsive, highly localized and full-featured. 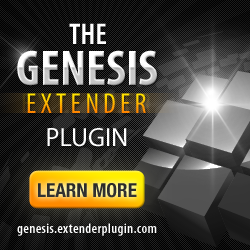 In addition, this plug-in is extremely easy to install, offers support, backup database import and export features, auxiliary shortcodes, as well as options for a variety of skin generators, and full functionality with video sites such as YouTube. This highly responsive and easily scalable gallery plug-in gives designers and developers the flexibility to create video intensive websites and blogs. Because the plug-in is so simple and easy to install it can be up and running in literally under five minutes. Creators of websites and blogs who are serious about integrating video into their work should strongly consider the advantages of using the Video Gallery plug-in. Premium Gallery Manager is a powerful and highly useful WordPress plug-in for galleries that features functions such as the ability to delete unwanted images with a simple click, the option to choose from five styles, a full-screen type slideshow feature, full Lightbox functionality, smart crop options that allow for visualizations of cropped images in a gallery, as well as the ability to drag and drop uploaded images. Installation of this plug-in is quick, simple and convenient and is easily activated from a WordPress backend. The plug-in comes with full documentation and customer support. In addition, premium gallery manager offers the ability to generate multiple uploads in its backend. This is a great plug-in for those seeking the ability to quickly and easily manipulate a variety of images for the purpose of uploading to a gallery. WordPress Media Gallery is a handy little plug-in for galleries that features several image options, as well as video, audio and in-line functionality. In addition, this great plug-in offers full compatibility with iPhone and iPad, and one minute simple installation. 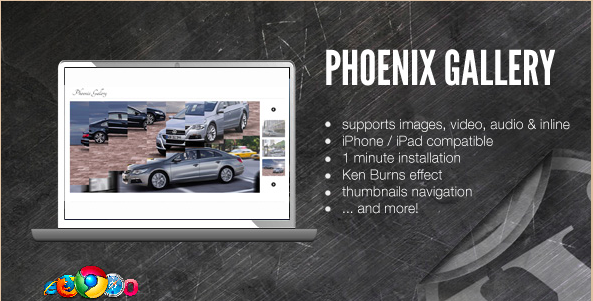 Other features include thumbnail navigation and its namesake the Ken Burns effect. The plug-in also offers 7 transitions, a highly intuitive and easy to use admin panel, a fully compatible slideshow mode, the ability to rotate items, and auto resize functionality, as well as value setting options. One of the main functionalities of this plug-in includes the Ken Burns affect. This unique effect has ability to enhance any presentation or website to catch the eye of visitors and helps to retain visitors once they’ve arrived on a website or blog. The plug-in is fully responsive and includes complete documentation and customer support. This powerful and versatile plug-in for galleries features a wide range of options including better support, Google analytics, as well as a variety of playlist options. The plug-in is fully responsive and highly functional and includes a series of video tutorials to help users gain quick insight into the use of this plug-in. In addition, other features include auto resize, full-screen functionality, auto hide for controllers, video streaming with buffer functions, preview image functionality, multiple video players management, volume control, auto playing the functionality, video description capabilities, video share functions, watermark capabilities, fully customizable playlists, shortcode functionality, as well as a full set of help files. Video Player WordPress Plugin offers many great features for designers and developers looking to add video functionality to their websites and blogs. DZS jQuery Flipbook is an excellent and highly intuitive WordPress gallery plug-in that features a video player, full Lightbox support, full cross-browser compatibility, iPhone and iPad compatibility as well as a comprehensive support forum. The plug-in is highly responsive and fully functional across a wide array of devices and features comprehensive customer support. This unique jQuery type plug-in is highly effective in offering a fully interactive media gallery for a wide range of presentations. In addition, it offers unique features such as neat effects for presentations, works across a wide variety of media and is not limited to images. The plug-in also offers powerful Zoomvideoplayer, as well as a host of other important and useful features. Those serious about designing video intensive websites and blogs should take the time to explore the benefits of using DZS jQuery Flipbook. 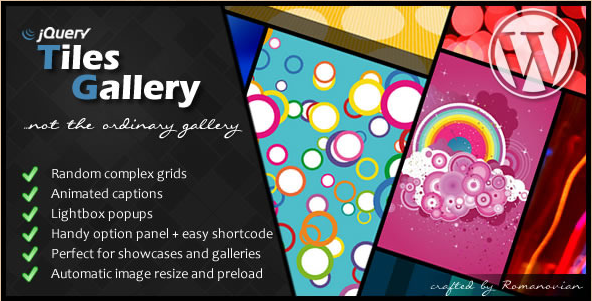 CCGallery WP offers a number of great features for WordPress galleries including Coverflow and thumbnail display modes, filters by file type and custom categories, fluid responsive design, touchscreen support, AJAX file upload capability, fully compatible gallery manager, as well as a host of other HTML5 multimedia gallery features. The plug-in allows for users to display images as well as audio and a wide range of video. In addition it offers two display modes, CSS 3-D transforms, the ability to detect mobile devices, fully fluid responsive design, functionality across a wide band of devices, scroll Coverflow images, two color schemes, the ability to change the styling of the gallery, as well as the ability to host media files in a wide range of services such as Amazon and others. 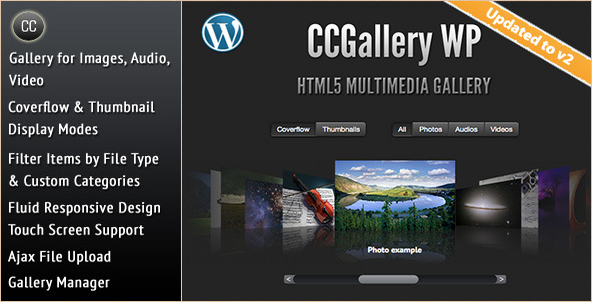 CCGallery WP – Multimedia Gallery offers a great way to add multimedia functionality to any website or blog. This powerful and extremely useful WordPress gallery plug-in is based on simple and highly customizable features that enable users to create a gallery in quick and simple fashion. In addition, this plug-in offers fully updated CSS, the ability to add icons to the jGallery menu, autostart, clean HTML, improved error checking in addition to add and edit with AJAX check for a pre-existing galleries. Other quality features include a completely renovated code base that has been reworked from the ground up and is fully backwards compatible with prior versions. The plug-in also offers complete compatibility with WordPress 3.0 as well as complete compatibility with jQuery 1.4.2+. The plug-in is fully functional and highly responsive and includes full documentation. Developers looking to create a stunning and attractive galleries via the WordPress platform should consider jGallery as their plug-in of choice. 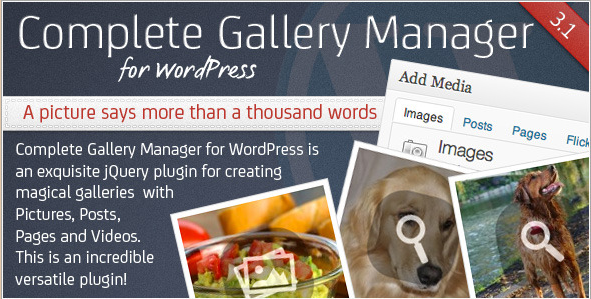 Complete Gallery Manager for WordPress is an intuitive and easy to use gallery manager for WordPress that includes a number of features including template settings, general settings, layout settings, gallery preview, sort settings, filter settings and combination filters, prettyPhoto settings and social media sharing, overlay icon settings, caption settings, universal scroll settings, pre-loader settings, item style settings, background settings, menu style settings, as well as live sample galleries. The plug-in allows users the ability to create unlimited numbers of galleries, insert galleries with simple shortcodes, as well as duplicate gallery functionality. Other features include support for templates, captions on photos, overlays on icons and several other unique features. The plug-in is fully responsive and fully functional and includes comprehensive documentation. In addition, the plug-in offers quick and responsive customer support. 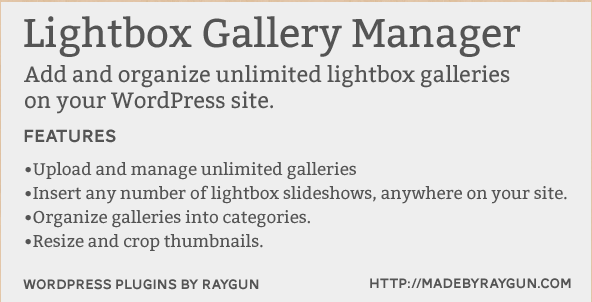 Lightbox Gallery Manager is a simple yet highly effective WordPress gallery plug-in that offers a wide range of powerful and useful features. For example, this plug-in allows for users to add and organize a virtually unlimited number of Lightbox galleries on any WordPress website or blog. Additional features include the ability to upload and easily manage a wide range of galleries, insert a wide selection of Lightbox slideshows throughout any website or blog, easily and simply organize galleries into a wide range of categories, as well as resize and crop thumbnails with ease. This product makes it simple and easy to quickly embed a wide choice of Lightbox galleries and to any WordPress site. The plug-in also features full shortcode functionality and excellent customer support. Designers and developers serious about adding full Lightbox functionality to their website or blog should consider this highly useful plug-in. Here is a unique and highly specialized WordPress gallery plug-in that offers a wide range of useful and functional features. For example, PhotoShow for WordPress offers jQuery functionality that makes it simple to add beautiful and stylish photo galleries to any website or blog. All this is accomplished through the simple functionality of a variety of easy to use and useful shortcodes. 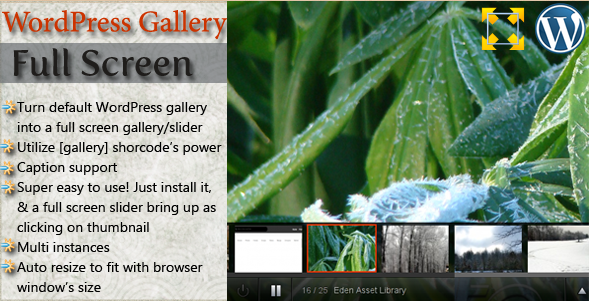 Other excellent features include photo and thumbnail views, full HTML image captioning, autoplay with an optional timer function, template tag support, full widget support, as well as a variety of plug-in options pages to make configuration simple and easy with all PhotoShow galleries. This product is fully functional and highly responsive and comes with complete documentation as well as comprehensive customers support that is highly responsive. Creators of websites and blogs will find this highly useful plug-in perfect for adding functionality for images and photos to any website or blog. Tiles Gallery is a simple yet very useful WordPress gallery plugin for 2012 that provides random complex grids, animated captions, Lightbox pop-ups, a simple options panel, easy shortcodes, automatic image resizing and preloading, as well as a wide range of other intuitive and useful features. The plug-in is perfect for showcases and a variety of image related galleries. This highly responsive and fully functional plug-in requires no graphic training or skills and requires absolutely no programming or coding capabilities. The plug-in allows developers to create scenarios where tile galleries will immediately display all photos, images or pictures in a single simple format. Adding captions to photos, images or pictures is simple, intuitive and quick. This fully functional and highly responsive plug-in comes with complete documentation and unlimited customer support. 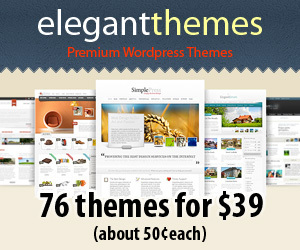 Those seeking to add titles and photo functionality to their website or blog should consider Tiles Gallery. uSquare is a jQuery based plug-in that is fully responsive and features a universal grid that can easily be implemented in displaying team members, services, products, design, and blog posts. This great product allows users to display content in a unique and inspiring way on websites and blogs. The plug-in comes with a full host of shortcodes and allows for custom icons, link over images, widget functionality, as well as a selection of other unique features. The plug-in is fully responsive and simple to install. In addition, it comes with full documentation and responsive customer support. Those who are seeking a responsive layout with great functionality will enjoy the benefits experienced through the use of uSquare. Designers and developers alike will appreciate the ease of use and highly intuitive format of this great plug-in designed to display content in a simple and highly visual way. Here is a WordPress gallery plug-in that features a jQuery style banner rotation functionality, as well as an easy to use image slideshow. In addition, this useful plug-in offers different image transition effects, fade functionality, horizontal and vertical slide functionality, the ability to load unlimited images, as well as the ability to fully customize text boxes, tooltips, and hyperlinks. Other features include image text box support, HTML tags, plain text, autoplay, startup with fully customizable time delay, image arrange functionality, image shuffle functionality, fully customized control panel, highly useful shortcodes, banner rotators on pages and posts, swipe navigation functionality, as well as mobile device compatibility. This very responsive and fully functional WordPress gallery plug-in makes banner rotation functionality intuitive, simple and easy to implement. 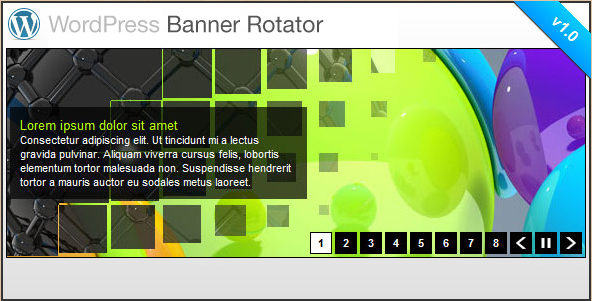 Creators of unique and attractive websites will enjoy the functionality and ease-of-use of this plug-in known as the WordPress Banner Rotator / Slideshow Plugin. WordPress Full Screen Gallery is excellent product that offers a variety of powerful features including the ability to turn default WordPress galleries into full-screen galleries. Other features include the ability to utilize a wide range of shortcodes, caption support, simplicity of use, easy installation, auto resize features, as well as a host of other unique and inspiring features. Those seeking to add full-screen functionality to websites or blogs will find that this particular plug-in is quite effective in creating those types of functionalities. By simply clicking on the thumbnail a user can expand an image to full-screen in a matter of seconds. This plug-in is highly responsive and fully functional and includes comprehensive documentation as well as full customer support. Discover the power of WordPress Full Screen Gallery today and take your website or blog to a whole new level. Vidplanet WordPress Video Sharing Plugin is an extremely useful video sharing WordPress plug-in that offers functionality such as the ability to create video playlists, video galleries, and video blogs. In addition, this plug-in offers the ability to incorporate videos from such video giants as YouTube and Facebook. The product features a wide range of shortcodes, as well as the ability to search videos via YouTube instantly. The plug-in is also able to create stunningly attractive video galleries with simple pop-up thumbnail previews. The plug-in is robust, highly responsive and fully documented. It includes responsive customer support and simple installation. The product is search engine optimization friendly, and features a number of portable templates. It also offers the ability to upload user videos quickly and easily. Designers and developers seeking to add incredible video functionality to their website and blog creations should consider this highly functional 2012 WordPress gallery plugin. Awesome Collection of wordpress photo gallery plugins and another nich photo gallery with Mac dock effect starting at here. Thanks for including my plugin (JIG). FYI there is v1.4 with a new preview picture. You are welcome, and the images generally get updated on a weekly basis. Check out our author interviews and let me know if you would be interested. Just wanted to add to the list one of my premium plugins: “WP Ajax Grid” which allows you to load your posts/pages/custom posts inside a very customizable grid using AJAX. Very useful for those looking for a plugin to create “Pinterest-like” websites or nice portfolios. Check out the Demo, or learn more here.